* The book includes full-color photographs throughout. They will be cleared for world use. 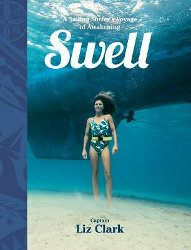 * SWELL hit #1 in 3 categories on Amazon (Adventure/Skiing, Outdoor Recreation/Skiing, and Surfing)! * Liz has over 140,000 followers and likes from her blog, Facebook, and Instagram. * The story of Liz’s on-board cat, Amelia, really hit a nerve with Liz’s fans. Read more here. * Liz is a National Geographic Adventurer of the year nominee for 2016, and a Patagonia Ambassador. About the book: True surfers understand that surfing is not a sport, a hobby or even a lifestyle. Instead, it is a path, a constantly evolving journey that directs where you go, how you live, and who you are. In 2006, Liz Clark decided to follow the path that surfing, sailing, and love of the ocean had presented to her. Embarking on an adventure that most only dream of taking, she set sail from Santa Barbara, solo, headed to the South Pacific. Nine years later she is still following her path in search of surf and self and the beauty and inspiration that lies beyond the beaten path. In stories overflowing with epic waves and at the whim of the weather, Liz captures her voyage in gripping detail, telling tales of self-awareness, solitude, connection to the earth, and really great surf spots.